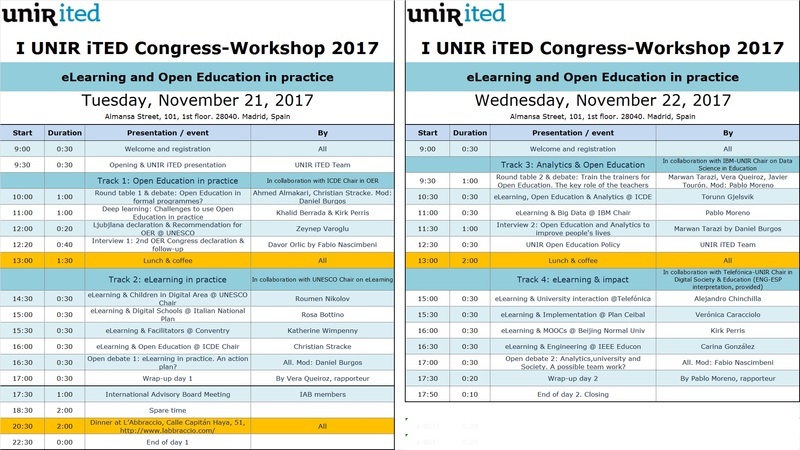 I was very pleased to be invited to the International UNIR iTED Congress 2017 on eLearning and Open Education: It took place on 21st and 22nd of November in the premises of the UNIR university in Madrid. Experts and colleagues from four continents came together to exchange and discuss latest experiences and challenges for introducing eLearning and Open Education and achieving impact in practice and society. My provocative title and guiding question of my speech in the afternoon was: “eLearning and Open Education: Why should we do it?” and I was happy that it was leading to a lot of queries and a lively and encouraging debate. In the morning the panel on “Open Education in formal programmes?” had opened the Congress: I was discussing the difficulties in schools and higher education worldwide together with Ahmed Almakari from the Ibn Zohr university in Marocco with focus on the societal changes and development needs on all three educational levels (micro, meso and macro). It was moderated by Daniel Burgos, Vice Rector of the UNIR and Congress Chair. Another highlight on the first day was the report and outlook by Zeynep Varoglu from UNESCO on the UNESCO World OER Congress and Declaration 2017 that took place in Ljubljana in September 2017. followed by an interview of Fabio Nascimbene from UNIR with Davor Orlic from the Slovenian Congress organizers. Further speeches were focusing Deep learning (by Khalid Berrada, Marrakech and Kirk Perris, Canada and China), eLearning and children in digital area. (by Roumen Nikolov, Bulgaria), eLearning and digital schools (by Rosa Bottino, Italy) and eLearning and facilitators (by Katherine Wimpenny, United Kingdom). The second day included a round table on Train the trainers for Open Education with Marwan Tarazi (Palestine), Vera Queiroz (Brazil) and Javier Tourón (Spain), mod. Pablo Moreno (Universidad Internacional de La Rioja, Spain) as well as speeches on eLearning, Open Education and Analytics by Torunn Gjelsvik (ICDE, Norway), eLearning and Big Data by Pablo Moreno (Spain), UNIR Open Education Policy by Daniel Burgos (Spain), eLearning and implementation by Verónica Caracciolo (Uruguay), eLearning and MOOCs by Kirk Perris (Canada and China) and eLearning and engineering by Carina González (Spain). For all pictures and interviews visit the Flick album, the video links as well as the Storify summary by UNIR iTED. Dr. Christian M. Stracke is Associate Professor for Open Education and Innovation at the Open University of the Netherlands. In addition he is Advisory Professor at the East China Normal University (ECNU) in Shanghai, and Adjunct Professor at the Korea National Open University (KNOU) in Seoul. His main working fields are Open Education, technology-enhanced learning, educational policies and philosophy, learning innovations and quality, impact assessment and competence modelling. He has founded and established ICORE, the International Community for Open Education and Research and LINQ, the annual international conference on Learning Innovations and Quality. He has got 20+ years of business and research experience in HR and E-Learning in leading research teams and large scale projects (> 100 projects, > 50 Mio. EUR) and in consulting institutions and public authorities to develop long-term policies. His latest news online at: www.opening-up.education.